Mathematics is not always a favorite subject with kids. Sometimes, even basic addition and subtraction can be tricky for your kids. One of the most interesting ways to help your child learn and love math is by presenting it in the form of coloring sheets. 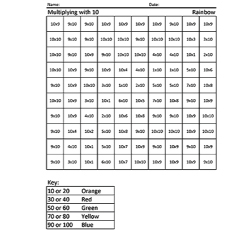 Color by number multiplication worksheets are very popular with parents as well as teachers. 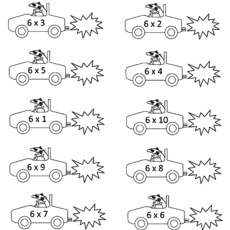 Here are some free multiplication coloring sheets for your kids. This article includes easy and hard versions of multiplication aimed at both younger and older kids. Are you looking for creative and fun ways to get your child learn multiplication? Then this coloring sheet is just for you. Coloring squared is a unique idea if you have tried everything to get your children like mathematics, but failed. Coloring squared helps your kids practice math concepts while creating pixilated images. Does your child hate multiplication? Then he will change his mind after seeing this coloring sheet which features simple multiplication problems made on a turtle’s shell. 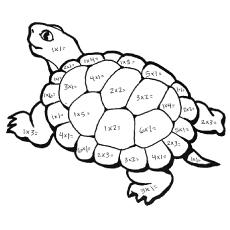 Ask your child to solve the multiplication problem they see on this turtle. Then ask him to color the turtle in green and brown. As he works on the coloring sheet, he will improve his mental math skills and multiplication facts fluency. Who knew that asking your third grader do some math practice could be this easy? Your car loving kid will surely be delighted to flex his multiplication muscles in this coloring sheet. After he is done multiplying the digits, ask him to fill the cars in different colors. This coloring sheet is ideal for second graders. If your little one is creatively inclined but needs some help in learning the multiplication tables, then this worksheet is just for him. 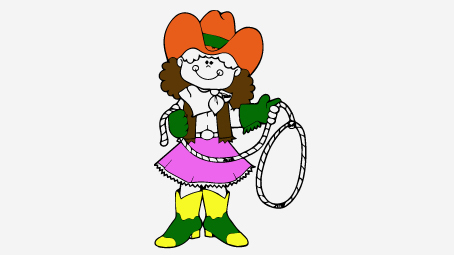 The coloring sheet features a little cowgirl in action. This coloring sheet will make practicing multiplication fun for your little one. 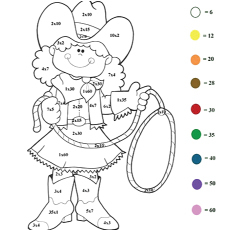 After he solves the problem, ask him to color the little cowgirl according to the colors assigned. 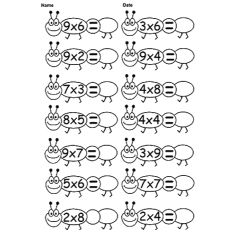 Your child will love memorizing the multiplication tables with this cheerful ant coloring sheet. This coloring sheet will make her understand multiplication while working on his fine motor skills. The diagram is also easy for your toddlers to fill in. Ask them to color the background in green and ants in red and brown. Here is a fun multiply-and-match coloring sheet for your young kids. 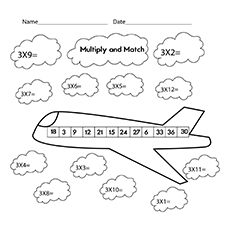 Instruct your child to multiply the digits they see in the cloud and then match it with the figures made on the airplane. Ask them to fill colors in the clouds and plane and make it as colorful as possible. Tell your child to color the background blue and white to give an appearance of the sky. This coloring sheet will not only help her practice some basic multiplication, but will also improve her hand-eye coordination. Help your third grader with his multiplication problems with this coloring sheet. It will surely make your kid’s mathematics class full of fun. Ask him to multiply the digits and then color the crowns in different colors. This will make it look colorful. You can also pin this coloring sheet on your soft board. 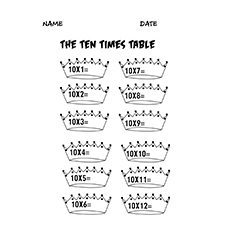 This will help your kids memorize the multiplication tables better. Kids love ice creams. 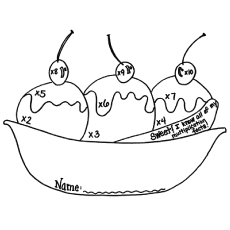 Then why not give them a worksheet that involves multiplying the ice cream scoops and cherries? Reward your child with a scoop of ice cream after he completes the worksheet. This will tempt him to work more on these kinds of coloring sheets. You can also hang this colorful work of art on the refrigerator. Here are some cute little kids holding multiplication problems placards. Why don’t you ask your kids to solve the mathematics problems for them? 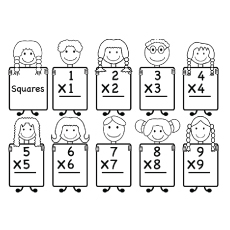 Your child will practice recalling the multiplication tables as he completes the problems. Then he can color the sheet any way they want to. This coloring sheet will surely help your child get ahead in math. 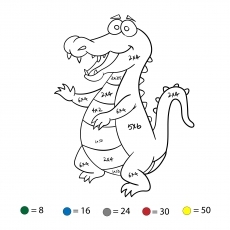 This cute crocodile worksheet offers much more than multiplication enrichment to your kids. It can also help your child develop his creative abilities. After he has completed the multiplication problems, ask him to color the diagram according to his answers. The coloring sheet will help your child master the art of multiplying. We are sure your kids will have a great time with these free printable multiplication coloring worksheets online. These free multiplication coloring worksheets will improve your child’s problems-solving and other mathematical skills.